Is homeopathy safe for babies? Should your baby have homeopathic medicines? A mother wants everything to be absolutely safe for her child. While she can’t see her little one in pain, she is also scared of giving too many antibiotics. When a baby falls ill, he feels irritated and becomes cranky. This makes the mother hit the panic button and she frantically searches for a medicine to soothe her baby. In such a situation, mothers usually rush to the doctor, who prescribes a course of antibiotics to get rid of the infection. One often thinks is homeopathy safe for babies as well in situations like this one. Also read: Is it safe to give the Janam Ghutti to colic baby? Although antibiotics definitely help to soothe the baby and work fast to curb the infection; they have many side effects in the long run. Taking too many antibiotics affects the liver adversely and also weakens the natural immunity of the body. It is better to look for natural alternatives. So, if you are aware of certain allergies or infections like cold and flu that your child usually gets around a particular time of the year, you should take some precautionary measures. Some mothers also ask if they can give homeopathic medicine to their children. Homeopathy was developed more than 200 years ago in Germany but many mothers still have doubts about its authenticity and whether it is safe to use on babies and children. Homeopathy doesn’t treat just the illness; it treats the individual symptoms of a person and the medicines are derived from plants and minerals. A homeopath takes into account a lot of factors before giving the medicine. These include dietary habits, lifestyle, routine, past history of illnesses, sleep pattern, and emotional issues. Homeopathy is a gentle yet extremely effective form of medicine and if administered properly, babies and children respond very well to it. Also read: Are Nasal Sprays Safe For Babies? #1. Homeopathic medicines are very mild, and are less unlikely to have any adverse effect – Made up of minerals and plants and given in highly diluted form, there are extremely rare chances of having any side effects. #2. They do not affect the liver and gastrointestinal system – They are not as harsh or strong as allopathic medicines and are easy on the stomach and liver. #3. They do not weaken the immunity of the body – Since homeopaths take into account the symptoms of an individual, they actually help to boost the child’s immunity. #4. They do not contain any chemicals or artificial colors – They are composed of plants and minerals and this makes them completely safe for babies and children. #5. They are easy to store. Just keep them in a cool dark place. You do not have to refrigerate them or make any effort while storing them. #6. They are non-addictive – Since they do not have any chemicals or drugs, one doesn’t get addicted to them, as is the case with many allopathic medicines, especially cough syrups. #7. Most importantly, the sweet tasting pills are easy to give to babies – Babies do not like the taste of conventional allopathic and antibiotic medicines. They readily take homeopathic sweet pills. 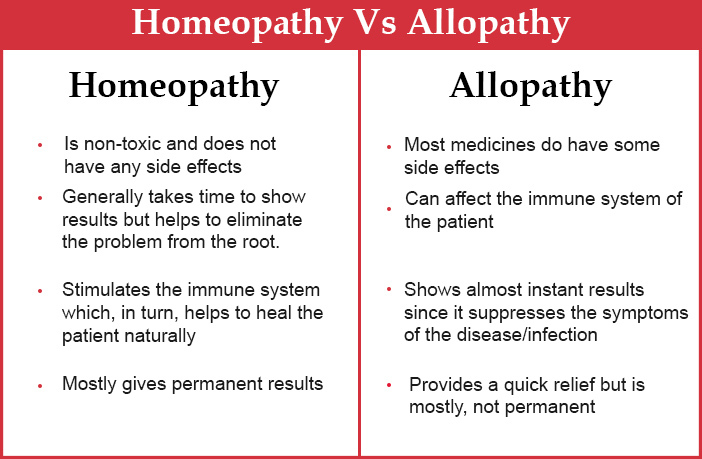 Why should you choose Homeopathy over Allopathy? Hence, as Gandhiji too has written long years back, ”Homeopathy cures a greater percentage of cases than any other method of treatment. Homeopathy is the latest and refined method of treating patients economically and non-violently.” This holds true in today’s time as well. Note: Homeopathy takes time to show results so you must check with your pediatrician before going ahead with it. In case, your child has serious health issues, it would be better to consult a pediatrician.